Binance is a centralized cryptocurrency exchange with a focus on crypto-to-crypto trading. 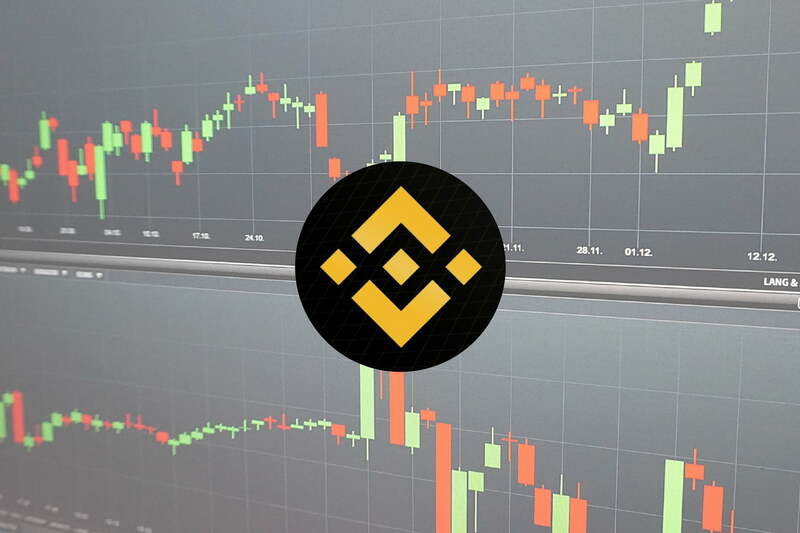 Binance is known among crypto traders for its extremely low trading fees and its impressively performing coin, Binance Coin (BNB). Binance sees itself as a global destination for cryptocurrency trading, creating a multilingual support over a variety of services. The company started in Shanghai, moved to Hong Kong, and is now based in Malta, a country which has been lauded in recent times for its friendliness to fintech and blockchain. Binance accepts deposits only in cryptocurrency; fiat deposits and withdrawals are yet to be implemented on the platform. There are no fees on the deposits, but there is a fee on withdrawals. Binance lists a growing number of coins on its platform, from popular ones like Bitcoin, Litecoin, Ethereum, and Cardano, to more esoteric altcoins like IOTA and Waltonchain. Binance was launched on July 14, 2017 with a successful ICO raising about $15 million in 2 weeks. The ICO offered the BNB token to prospective crypto traders on the promise that it would lower the trading fees beyond what other crypto exchanges offered. Since then, other crypto exchanges have followed this successful business model. Binance was founded by Changpeng Zhao and Yi He. Changpeng Zhao was previously CTO at OKCoin (a platform for spot trading between fiat and digital assets) for less than a year before founding Binance. Zhao previously founded Fusion Systems in Shanghai in 2005, a company that builds high-frequency trading systems for brokers. In 2013, he joined Blockchain.info as a member of the cryptocurrency wallet team before leaving for OKCoin. Yi He also worked at OKCoin as head of branding and marketing. 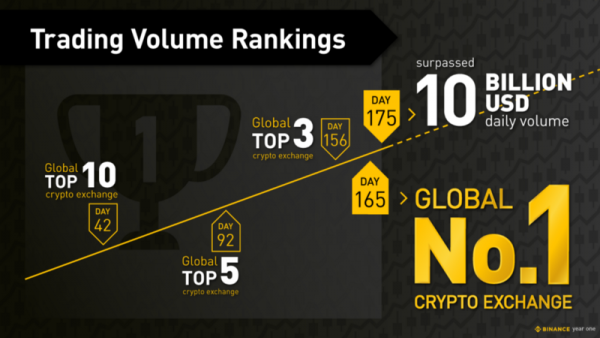 According to the first year report of Binance, the crypto exchange achieved top 10 status in trade volume rankings just 42 days after their launch, and they hit #1 after 165 days. This sums up the success Binance has encountered due to their business model, leadership, global support, and technical expertise, but is by no means all they have to show for it. Binance Coin is an ERC-20 token created by Binance to serve their business interest in trading. Binance users were given a 50% discount (in the first year) on an already low trading fee (0.1%) for holding BNB. In the second year, which began on July 15, 2018, the discount was reduced to 25%, as proposed. In the third year, the discount will be further reduced to 12.5%, and then 6.25% in the fourth year. From the fifth year and forward, there will be no discounts. A total of 200 million BNB was created, and it began with a starting price of 0.00005 BTC. In their whitepaper, Binance pledged that evey quarter they would use 20% of their profits to buy back BNB and conduct a coin burn. They aim to burn a total of 100 million tokens. So far, over 7 million BNB have been burnt over the course of 4 quarters. This is to cut the supply and counter the effect of dropping demand through the yearly discount reductions. The primary purpose of the Binance coin is reducing trading fees. However, the coin can also be used to participate in certain ICOs that take part on the Binance Launchpad program, and will thereafter seamlessly be listed on the Binance exchange. Also, on May 18, 2018, Binance announced that the referral commission rate for users holding more than 500 BNB will become 40% from 20%. This creates another demand for BNB. With the yearly drop in trading fee discounts, the demand for BNB tokens is expected to drop. However, the quarterly burning of tokens makes the supply drop as well, which can reduce or even swallow up the effect of the decreasing demand on the coin’s value. However, the strong suit of the Binance coin is that new value can easily be created for it by Binance. One example of this is their announcement to double commission rewards for accounts holding more than 500 BNB. This incentivizes holding onto BNB, as there may be more reasons to hold BNB in 4 years’ time because of the potential of what Binance can come up with. Binance Coin had a value of 0.00005 BTC after the ICO, and in recent times has seen a high of 0.0026325 BTC. In fact, BNB was one of the stable, safe haven coins during the recent bear market that affected almost every other coin. Binance currently has 73 trading pairs with BNB (excluding Bitcoin, Ether and USDT), making it a very liquid asset for trading. The value of the Binance coin is expected to grow in proportion with the Binance platform, as more extensions of the Binance ecosystem are created. Due to the centralized nature of the exchange, more use cases can be created for BNB account users. An example is the announcement of Binance Chain and the value it will give BNB (as its native coin). The more Binance grows, the more use cases will be created for BNB, and with only 100 million planned to be left in circulation, the prospects for BNB look very promising. Binance Uganda has already opened registrations as the first fiat-to-crypto exchange on Binance. Binance has also announced the development of its own blockchain known as Binance Chain. The Binance coin (BNB) will be upgraded to exist on its own mainnet, making it a native coin. The Binance Chain will focus on performance, ease-of-use and liquidity. Binance has also partnered with The President’s Trust in Malta to create the Binance Blockchain Charity Foundation. Upcoming developments yet to be formally announced include the Binance Academy and Binance Research. Binance has been a phenomenal success story in the cryptocurrency world, arguably the fastest company to exceed $1 billion in valuation (that is, in less than 6 months). The success has not been without hurdles, rumors, scams, and hacks, but the company has handled these adverse situations very well. The Binance ecosystem continues to grow even as there is no obvious challenger yet to its leadership in cryptocurrency exchange. The Binance coin will most certainly continue to grow as more use cases are created for it. To begin trading on Binance, get started by opening an account.